VANCOUVER, BC – A new film by Emilie Crewe contrasts natural and manmade elements of Vancouver and the team of Castle Grünenfelder Ingram present images of local indigenous fruit trees in transit shelters. Ben Bogart’s computerized abstraction surrounds the light structure at Queen Elizabeth Plaza, and an image from Laiwan’s film Barnacle City will show at the Canada Line City Centre Station. The Coastal City series of temporary video and print public art commissions launched on May 16 with new works appearing monthly. PLATFORM: Downtown Video Screens. Thanks to our screening partners: CoreVision (Granville and Robson Screen), CBC, Telus Gardens, Terry Fox Plaza, VanCity Theatre and Pacific Cinematheque. 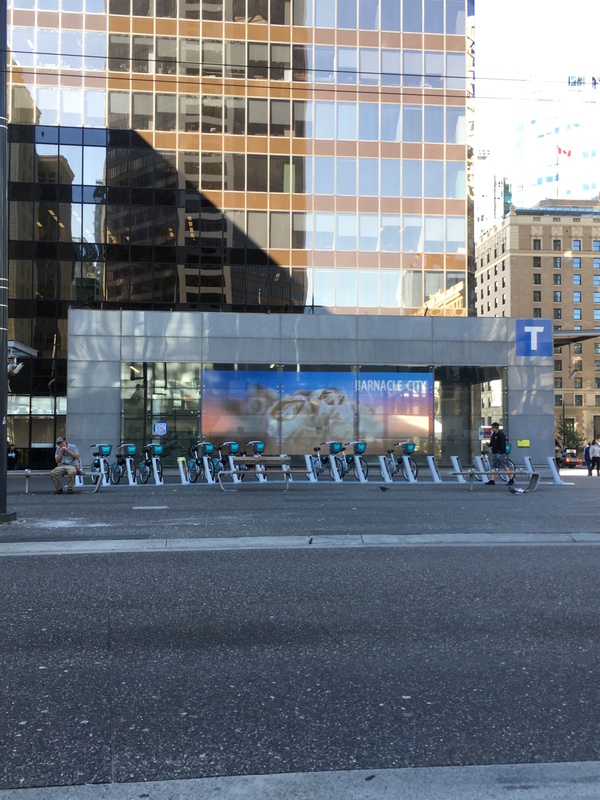 PROJECT SYNOPSIS: Emilie Crewe’s video seeks to characterize the “personality” of Vancouver by bringing to light the contrasting natural and manmade elements of our city. In response to use of the city as a stand in for other cities in films and Gertrude Stein’s idea that “There is no there there,” Crewe’s video attempts to locate Vancouver in the ebb and flow of micro and macro images of this place. BIO: Emilie Crewe works in installation, sound, sculpture and single-channel video. In 2014, she received a City of Vancouver public art commission for a video as part of the award-winning Reconciliation series. She holds a bachelor of fine arts degree from Nova Scotia College of Art and Design (NSCAD) University and a master’s of fine arts from the Art Institute of Chicago in Film, Video, and New Media. PROJECT SYNOPSIS: The collective Castle Grünenfelder Ingram’s transit shelter posters are a visual homage to indigenous perennial fruit crops through photos and language. Only a few of these early varieties still exist. The posters will celebrate two of these: the crab apple and choke cherry. The images are pixilated and impressionistic, a montage of different viewpoints to represent the “thicket” structure in which these varieties tend to grow. The posters provide the common name of the plants in several languages. Alex Grünenfelder attended Emily Carr Institute of Art and Design and the Nova Scotia College of Art and Design, and has a bachelor of arts in philosophy from McGill University. He has produced interactive media and sound pieces, performances, and projects independently and for 221A Artist Run Centre, Access Gallery, and the Audain Gallery in Vancouver, as well as other places. Gorden Brent Brochu-Ingram has a diverse practice including urban design, graphic books and projects for public spaces. He has a PhD in environmental planning from the department of landscape architecture, University of California, Berkeley. Julian Castle works in video and photography, media installations and site art. He has studied environmental design and computer science. PROJECT SYNOPSIS: Artist Ben Bogart works with imagery that is generated by a computer. His interest is in relation between the world as we see it and the world as we understand it to be, which is all wrapped up in abstraction, the act of emphasizing some details in order to dispense with others. The work on display is a dense collage composition that emerges from thousands of photographs from the site of installation. The bottom of the image shows this imperfect photographic illusion, a proxy of objective reality, that becomes increasingly abstracted towards the top. This is the nature of the coastal city, a rainy city where the edges sometimes disappear into the atmosphere. The abstraction is a proxy for the constructive powers of imagination and is the result of a machine learning process that rearranges colour values according to their similarity. The image is a representation of place (as a physical location) and non-place (as an ambiguous and emerging structure under constant renewal). BIO: Ben Bogart is an interdisciplinary generative artist based in Vancouver, Canada. His practise is highly process and conceptually oriented and has resulted in theories, texts, still and moving images, improvisations, and objects. He has presented work at academic conferences and art festivals internationally. Physics, mathematics, computation, and brain science have been used to inform and engage in his creative process. 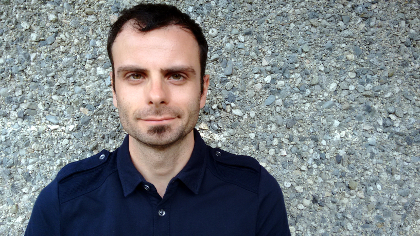 Ben holds a Ph.D. in Interactive Arts and Technology from Simon Fraser University. PROJECT SYNOPSIS: The image at City Centre is a mirage where giant barnacles arise out of the mist. Barnacle City by Laiwan projects imaginative possibilities of a future city, or perhaps a city that once was, in which natural accretions are anchored among man-made structures. Where is this science-fiction inspired city? You will recognize Vancouver’s cityscape dramatically altered by this utopian (or dystopian?) vision, alive with ocean forms. Visit the station and click on the QR code beside the artwork to view a short film. BIO: Laiwan is an interdisciplinary artist, writer, and educator with a wide-ranging practice based in poetics and philosophy. She exhibits regularly and curates projects in Canada, USA, and Zimbabwe. Laiwan teaches in the MFA in Interdisciplinary Arts Program at Goddard College in Washington State, USA. She founded the OR Gallery (1983) in Vancouver and holds a MFA from Simon Fraser University for Contemporary Arts. The fifteen new works that have been commissioned for the “Coastal City” series, are an opportunity for artists to explore the border between land and sea, the designation of boundaries and life in a region near the shore, the changing land and ocean-scape, the influx of people and goods, the unique ecosystems, challenges and opportunities – the circumstances that make coastal cities such as Vancouver unique.